TNPSC Group 2A Exam 2014 Answer Key Download Now Available. TNPSC Tamilnadu Public Service Commission conduct many exams for various department in Tamilnadu recruitment. Last 16.04.2014 tnpsc gives notification for new tnpsc group-IIA exam. This Exam conduct on 29.06.2014. tnpscgroup2a key answer for private institutes is published very soon. Also tnpsc publish the answer key as soon as possible. TNPSC group2a exam conducted in 114 Zones and 2,217 centers in tamilnadu.6,32,672 candidates appear for this exam. But 2,846 posts will be filled via this exam. Note this tnpsc group2a exam is a non interview post exam. This exam conduct 10 am to 1 pm in 29.06.2014. In this exam will be check directly via "Web casting" method. TNPSCgroup-IIA exam will be conduct 29.06.2014. But in this same date some exams also conducted, like SBI Bank Exam, NET Exam. So some candidates try to attend other exam also. But many of the candidates attend tnpsc group - 2a exam only. Because no of posts is much more higher than other exam. So in this year lot of competition running for all candidates. So study Hard. TNPSC group II A exam Officical Answer key will also publish within the week. So as soon as possible we publish it. 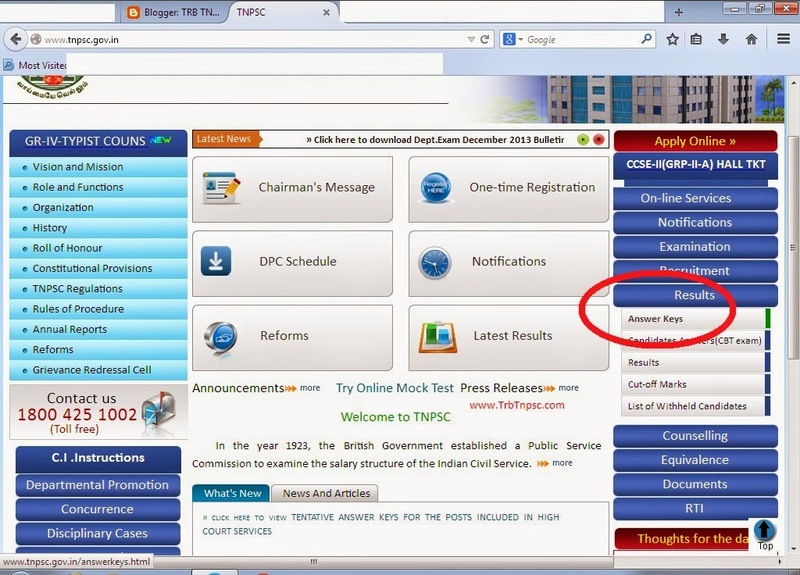 If you want to download tnpsc group2a Official answer key please go to tnpsc's official website http://www.tnpsc.gov.in/ and select right side bar answer key -> then download answer key. otherwise http://www.tnpsc.gov.in/answerkeys.html click this direct link for tnpsc group2a Official key answer.